The complex was designed by Lutyens for Mr H G Fenwick in 1913 as the farm for Temple Dinsley. 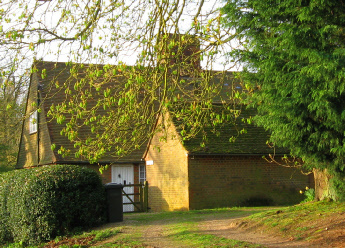 It was known as Home Farm, then Minsden Farm but today it is called Ladygrove. The buildings have solid walls, with no cavity, in English bond, with alternate rows of ‘headers’ and ‘stretchers’. The brickwork is dark red with dressing of a lighter red. The roofs are steep and are of handmade red tiles. 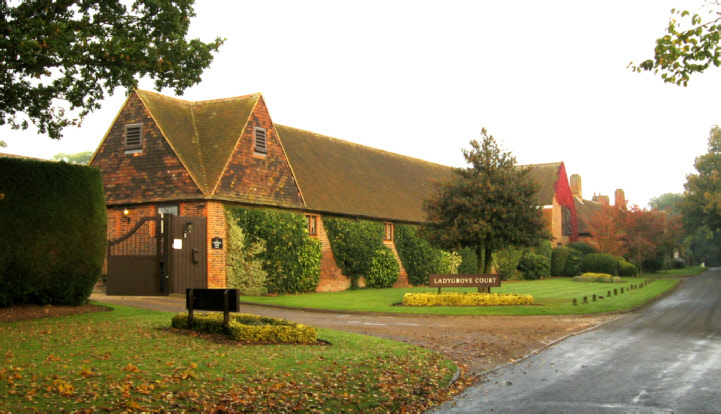 The farm is compactly laid out with single and 1 ½ storey buildings (B and C) arranged around a courtyard and dairy complex. This is open-ended to the south. There are two cottages (A) to the north. Access to the courtyard was originally between these cottages, through an archway. This is part of a two-storey, red-roofed cross range and perched on top of the archway is a wind-vane featuring a cow. 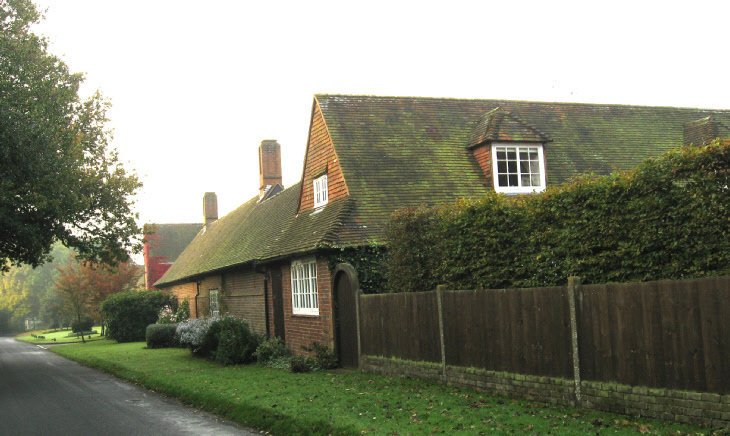 The view towards the two cottages from School Lane is symmetrical. The identical, detached homes are 1 ½ storeys high with steeply pitched mansard roofs of hand-made red tiles. At the eaves are hipped dormers. At ground level are flush, wooden, two-lights casement windows beneath arches. Each cottage has a typical Lutyens tall slab central chimney with his trademark waisted top and clasping corner pilasters. To the south and north, the chimneys have projecting panels. 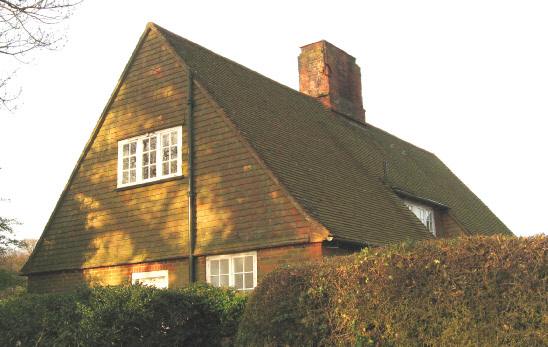 In 1945, the cottages had two living rooms, kitchen, scullery, bathroom, three bedrooms and an outside barn/wash-house. 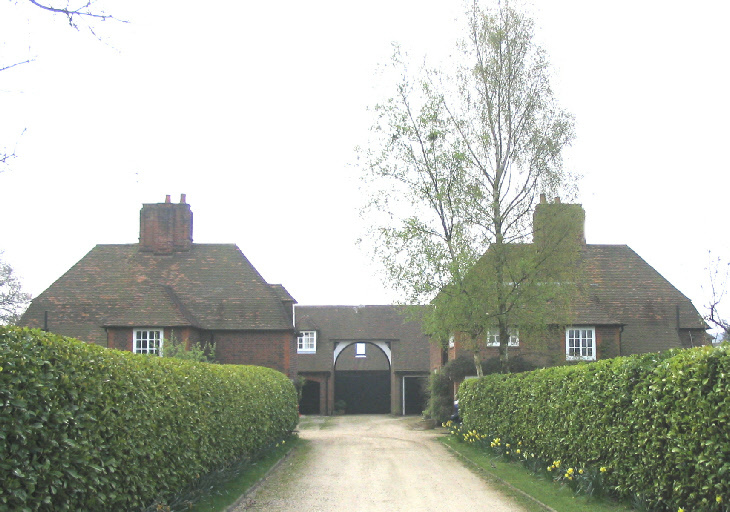 To the east of the courtyard are now stables. In 1945, there were nine calf pens, five calving boxes and a seven-bay hovel. Today, on the west side of the courtyard there are more stables but sixty years ago there were four calving boxes, an office, two stores and a garage. 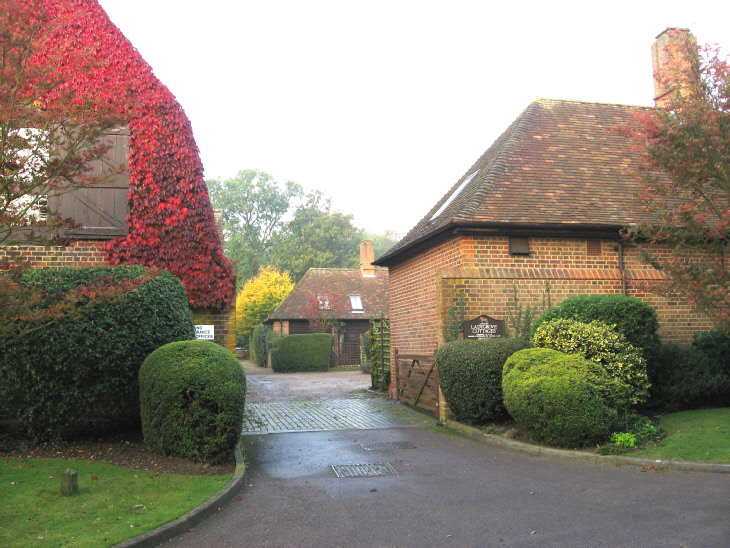 In the centre of the courtyard is Dairy Cottage which is surrounded by stables. In 1945, the building comprised a dairy, washing room, butter room, sterilizing room with a Hallmark automatic refrigerator and boiler house. By 1970, the dairy had fallen derelict, but then it was renovated, re-roofed and converted following the design of the other cottages. A wall was built across the archway blocking off the approach between the two cottages. To the south of the courtyard is a cattle yard with three lower-pitched roofs. In 1945, these were made up by two cow-houses with 72 ties, a washing and a grinding room, seven bull boxes, an insemination room and stores. Clearly, the farm has changed from a dairy operation sixty years ago to the stud farm that it is nowadays. 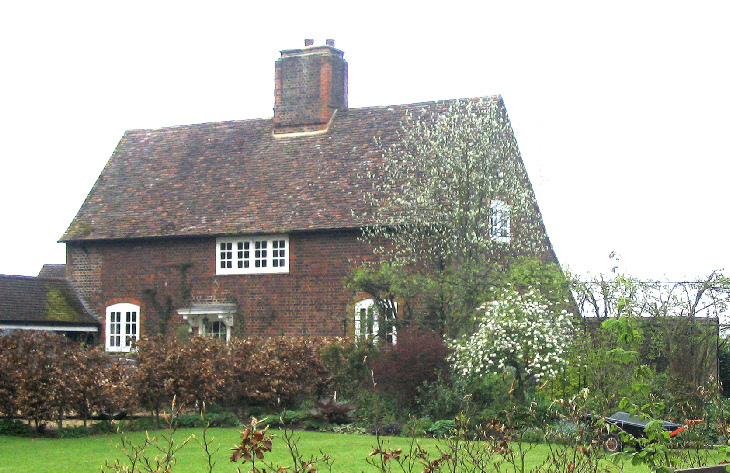 Built in 1912 as the estate carpenter’s home, Kiln Wood Cottage (shown below) and linked outhouse were designed by Lutyens for Mr H. G. Fenwick. The house is of two storeys. It is built of red bricks in English bond - a solid brick wall, with no cavities, comprising alternate rows of ‘headers’ and ‘stretchers’. The roof is constructed of red tiles, steep at the front to bellcast eaves and carried down as a cat-slide with less of a pitch at the rear. At the front on ground level is an off-centre door which is panelled and half-glazed. Above the door is a flat moulded hood on brackets. Also on the ground floor are a couple of two-light, flush front windows with small panes. At the first floor, there is a long, central casement window with small panes which illuminates the stairwell. 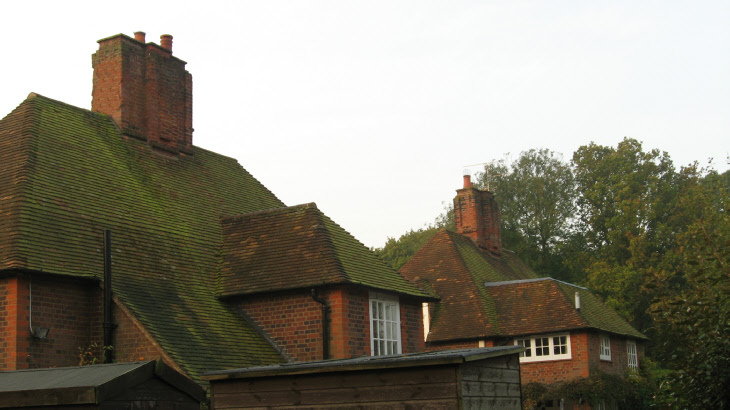 The typical Lutyens large chimney has a waisted top and clasping corner pilasters. The cottage originally had two living rooms, a kitchen, a scullery, three bedrooms and a bathroom. 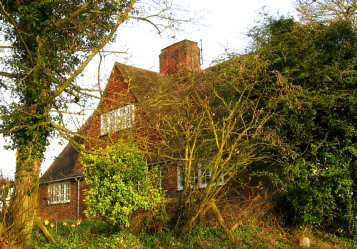 It was sold on 18 September 1945 as part of the Minsden Estate. 1 and 2 Hitchwood Cottages (shown below). 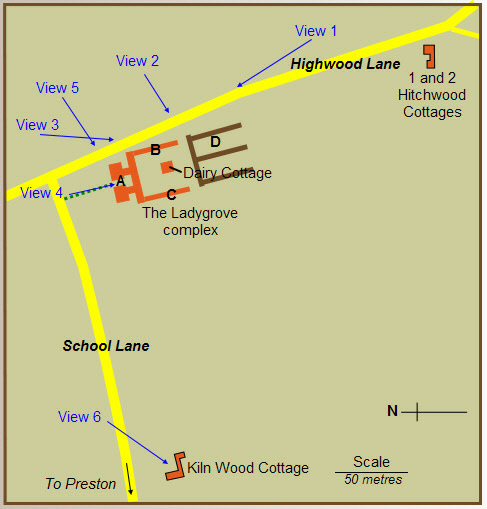 In 1913, Lutyens designed two estate cottages for Mr H. G. Fenwick along Highwood Lane (see map above). They were associated with Home Farm (now Ladygrove).These are semi-detached with a joint outhouse/wash-house, which has door and window. They are of one storey with an attic block. They are built with a narrow red brick with lighter red bricks around the windows and at the corners of the buildings. The gable ends and south side are tile hung and the cottages has a steep roof of red tiles. There is a large central chimney which has recessed panels and a waisted top. The flush casement windows have small panes with wide glazing bars. On the north side, there is a recess in the middle of the cottages which is filled by a first floor window for both. Also on this side is a moulded plank front door set in a heavy frame. The cottages had a living room, kitchen, scullery, larder and three bedrooms. On 18 September 1945 they were sold as part of the Minsden estate.